An internationally known theologian will give a free talk at St. Scholastica and host a two-day workshop on campus. Ilia Delio, OSF, of Villanova University, will address the topic of "The Chaotic Path to Wholeness: Catholicity and the Logic of Love," at 7:30 p.m. Thursday, Nov. 1, in Mitchell Auditorium on the St. Scholastica campus. The talk is free and open to the public. 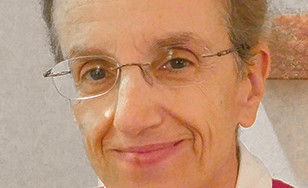 Dr. Delio, a Franciscan Sister of Washington, D.C., will focus on how humans yearn for wholeness and unity, yet the way forward is not exclusive, symmetrical, or orderly. She holds the Josephine C. Connelly Endowed Chair in Christian Theology at Villanova University and has authored 18 books, including "Care for Creation," which won two Catholic Press Association Book Awards. She lectures internationally in the areas of science, religion and culture with a focus on evolution and the Christian faith. She is the general editor for the series Catholicity in an Evolving Universe and the online website Omega Center. Her presentation is part of St. Scholastica's Braegelman Program in Catholic Studies Lecture Series. Meanwhile, St. Scholastica Monastery will host Delio for "Nature is Alive: Ecology and the Quest for Super Intelligence," a two-day retreat exploring the religious connections to the artificial intelligence and ecological movements. These two concepts were born in the same decade but have grown at vastly different rates. Within a wider framework of cosmic evolution through the lens of Teilhard de Chardin, a French Jesuit priest, philosopher and scientist, Delio will examine the question: Where is God and what is the role of religion in this trajectory? In presentations by Delio interspersed with music by Twin Ports singer-songwriter Sara Thomsen, attendees will gain a new awareness about nature and the ability of nature to become something new. Thomsen is the Founder/Director of Echoes of Peace, a non-profit inspiring awareness, action and reflection on critical social issues through music and the arts to build and bridge informed, engaged and caring communities. The retreat takes place from 7 to 9 p.m. Friday, Nov. 2 and from 9 a.m. to 3:30 p.m. Saturday, Nov. 3 in Somers Lounge on the St. Scholastica campus. The $75 cost to attend both days includes refreshments and lunch. To register or for more information, visit www.retreatduluth.org or call (218) 723-6536.